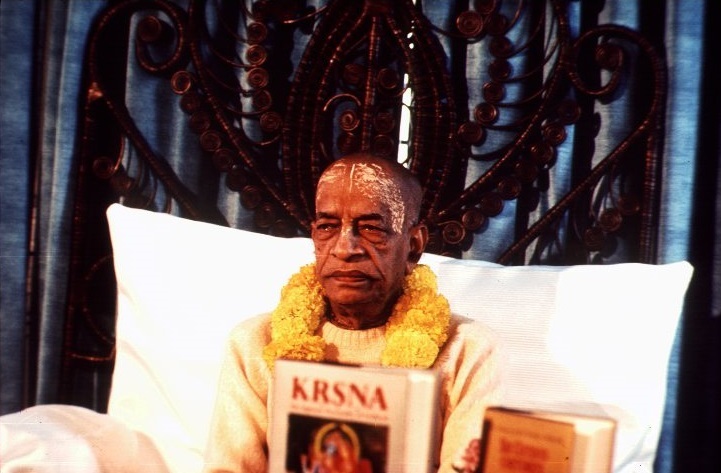 Prabhupāda: So what was your question? Prabhupāda: Yes, question, you question something. Guest: It's just people... For example, could the president of the Coca-Cola company find the way to Kṛṣṇa, to serve Kṛṣṇa? Prabhupāda: Yes, everyone can serve. Cola company? Guest: Somebody that manufactures a product which is basically destructive. Prabhupāda: No. Coca-Cola company... Of course, we advise... Kṛṣṇa advises, yat karoṣi. It includes Coca-Cola company. But He said yat karoṣi: "Whatever you do." Kṛṣṇa said, "Whatever you do." So that includes all kinds of activities. But will the Coca-Cola company agree to give the profit to Kṛṣṇa? Then he is Kṛṣṇa conscious. The profit he will enjoy for his wine and woman, that's all, not for Kṛṣṇa. That is the difficulty. Guest: Can the profit of the manufacture of something which is manufactured purely for profit be turned to good? Prabhupāda: Yes, if he gives to Kṛṣṇa. Just like Arjuna. He fought. He killed. Killing is not good business, but he killed on the advice of Kṛṣṇa, and he became a bhakta by killing. Kṛṣṇa said, bhakto 'si. And what did he do? He killed, that's all. This is an example. Of course, bhakta never kills. Kṛṣṇa... Arjuna was not willing to kill. But when he saw that "Kṛṣṇa wants it, so this is my first business. Never mind I shall go to hell," that is Kṛṣṇa conscious. "By killing my brother I may go to hell. It doesn't matter. But Kṛṣṇa will be satisfied. That is my first business." Kṛṣṇa sometimes pretended to be sick. And many physicians came, they could not cure Him, headache. So He suggested that "I think if My devotee gives their dust of foot on My head, then I'll be cured." Then every devotee was approached that "Give your dust of feet. Kṛṣṇa wants it." Even Nārada. So Nārada said, "How it is possible I shall give my dust of feet to Kṛṣṇa? No, no, no, it is not possible." But when the person, messenger, approached gopīs in Vṛndāvana and they were informed that "Kṛṣṇa is sick. So He wanted the dust of feet of the devotee to be applied on His head. Nobody gave it. So we have come last to you," so immediately: "Yes, yes, take it, take it." Immediately. So, so much dust was collected. And Kṛṣṇa was cured. So this is gopīs. Others thought that "If I give the dust of my feet to Kṛṣṇa, I may go to hell," but the gopīs thought, "Let us go to hell, but let Kṛṣṇa be cured." Therefore the gopīs are the first-class devotee. They do not care for themselves. That is recommended by Caitanya Mahāprabhu. Ramyā kācid upāsanā vrajavadhū-vargeṇa yā kalpitā (Caitanya-manjusa): "The process of worship as it was planned by the gopīs in Vṛndāvana, there is no comparison. That is the highest devotion." They did not care for themself. They simply wanted to satisfy Kṛṣṇa. When Kṛṣṇa was playing flute at dead of night, all the gopīs were flying to Kṛṣṇa. His father, his husband—"Where you are going in this dead of...? Where you are going?" They didn't care. 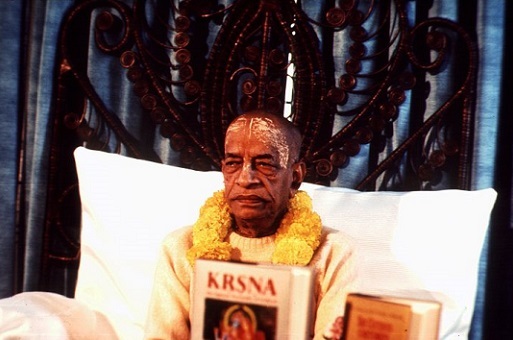 Society, friendship, love—all sacrificed: "We shall go to Kṛṣṇa." This is kṛṣṇa-bhakti. That is the highest perfection of life, to sacrifice everything for Kṛṣṇa: "Only Kṛṣṇa should be satisfied." That is Kṛṣṇa consciousness. But that is not very easy job. But one can do if he likes, everything for Kṛṣṇa. Kṛṣṇa says also, sarva-dharmān parityajya (BG 18.66). Gopīs did not care for social, for religious or family and nothing. Sarva-dharmān parityajya. They went: "Kṛṣṇa now is calling. Let us go." This is the typical example of sarva-dharmān parityajya mām ekaṁ śaraṇaṁ. So of course, it is not possible to become on the standard of gopīs. That is not possible. But at least we shall try to follow these devotees. Arjuna is there, gopīs are there, Uddhavas are there—many devotees. Lord Brahmā is there. Lord Śiva is there. Kapiladeva is there. The four Kumāras are there. Bhīṣmadeva is there. Prahlāda Mahārāja is there. Janaka Mahārāja is there. Śukadeva Gosvāmī is there. So mahājano yena gataḥ sa panthāḥ (CC Madhya 17.186). If we simply follow these big, big devotees, then our life is successful.